Marc Chagall – an artist who lives outside the rules. Even the Louvre could not stand against his works and, contrary to established traditions, organized an exhibition of the artist during his lifetime. Truly, Chagall is a unique painter who painted pictures, designed performances and wrote poems in Yiddish. He lived a long rich life, working in a style close to the avant-garde. His paintings are recognizable, because the style of the author can not be repeated. “Song of Songs” was written by Chagall in 1958, and inspired by the plot of the Jewish scriptures. There are many interpretations of plot lines, and the artist presented his original version to the viewer. Before us is the bride and groom, seated on a winged horse. Everything is unusual here. A red, blue horse with colorful wings and a bouquet of flowers in the front legs, a snow-white veil of the bride waving across the sky, a blue tree and tangerine mountains. Chagall received a classical art education, but never joined a certain trend. It is this dissimilarity that has become the calling card. Free from canons, the principles of the styles of his paintings are immediate, emotional. Juicy colors are clean, scenes are harmonious and spiritual. 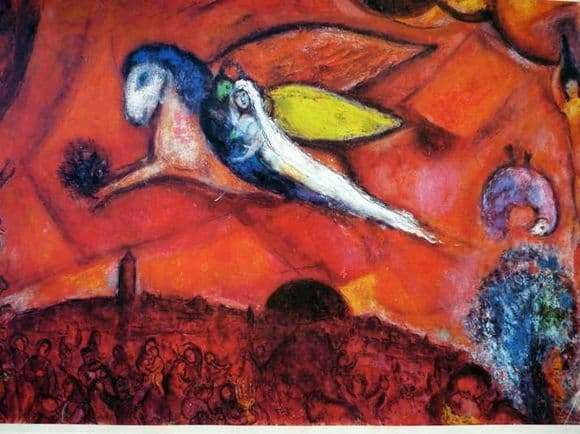 Marc Chagall knew the scriptures perfectly well, so the plot chosen for the picture is close and clear to him. “Song of Songs” means the most important of the songs, telling about the marriage of God and the Jewish people. In the picture – God (the bridegroom) on whose head there is a crown, a symbol of power. The bride (the people), a pure human soul, seeking to ally with the highest knowledge. The love between them is unselfish. Above worldly vanity (the outlines of the figures occupying the lower field of the picture) soar He and She, capable of giving and receiving love. It is not by chance that they sit facing each other, bowing their heads humbly, in token of consent of the union made in heaven. The picture belongs to the “red” period of creativity, positive, major and creative.